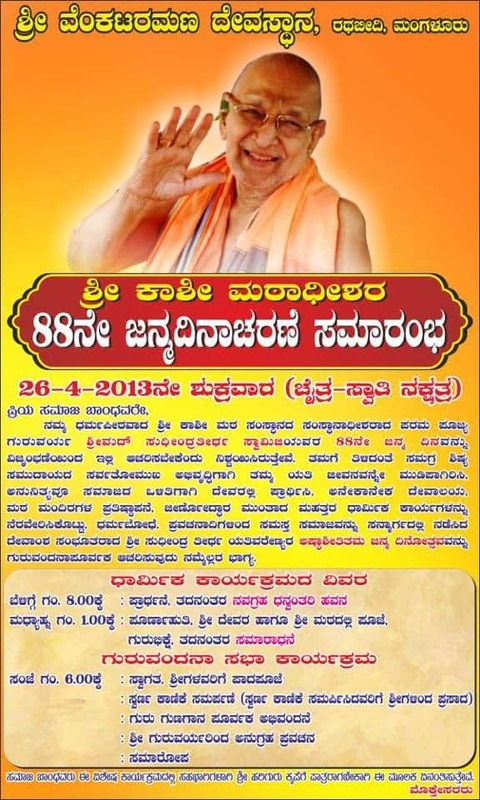 Indeed, it is the good fortune of the Shishya Warga being able to participate in the above holy celebrations, an occasion to pay obeisance reverentially at the lotus feet of Parama Poojya Swamiji under whose guidance and blessings our samaj has witnessed significant transformation and progress in every walk of life. No words would be adequate for a complete appreciation of what our Gurudev has achieved in the field of propagation of Dharma. It may be pointed out that the innumerable temples, mandirs and the branch maths founded, consecrated and renovated by His Holiness during the last several decades speak volumes about the glory of the era and the greatness of the Dharma Peetha of name and fame. We take this opportunity of extending our cordial invitation to you for your personal participation in the above celebrations to be worthy of the blessings of Sri Hari Guru. – ಸಮಾರೋಪ ಸಮಾಜ ಬಾಂಧವರು ಈ ವಿಶೇಷ ಕಾರ್ಯಕ್ರಮದಲ್ಲಿ ಸಹಭಾಗಿಗಳಾಗಿ ಶ್ರೀ ಹರಿಗುರು ಕೃಪೆಗೆ ಪಾತ್ರರಾಗಬೇಕಾಗಿ ಈ ಮೂಲಕ ವಿನಂತಿಸುತ್ತೇವೆ.